take a look at an old Converse ad featuring Kevin Johnson and the Accelerator. Let's be honest, the Accelerator is not exactly the most celebrated or remembered basketball shoe from Converse. Nonetheless, this is still a pretty cool old ad featuring Kevin Johnson and his thoughts on being a small man among giants and the importance of hard work and dedication. "...Hard work made you better at what you did. A better person, too." Very true. Kevin's hard work would pay off as he became a star for the Phoenix Suns and led his team all the way to the NBA Finals in 1993. By that time, he also earned his own signature shoe with Converse, the Run N' Slam, complete with an ankle strap and visible REACT Juice in the heel (and one of the coolest shoes I ever had as a kid!). The Accelerator has a fairly simple design and is definitely less flashy than the Run N' Slam, but it does utilize REACT Juice cushioning, also. 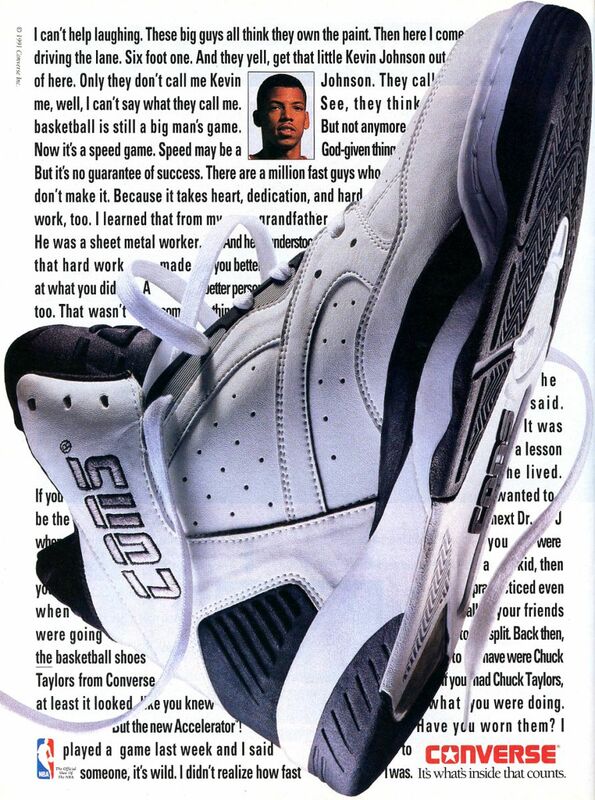 And If you don't believe Converse and Kevin Johnson were legit back in the day, I'll leave you with THIS.